We have been established since 2003 and have been pioneering rainwater harvesting technology ever since. Our systems have been developed to offer the very best in terms of efficient collection and usage, designed to work with all types of property. Our Monsoon systems are specifically designed for domestic properties. We’ve taken the best parts of our technology and designed compact and cost effective products to suit the home and ensure huge efficiency savings are achieved. We understand that every property is different in their water needs. That’s why the Monsoon system comes in a range of configurations; designed exactly around your needs. Our friendly team are experts in the field of rainwater harvesting and our customer care is exceptional (even if we are blowing our own trumpet a bit here!) All of us work together closely to ensure that you, our customer, is well looked after through the decision making and installation process. 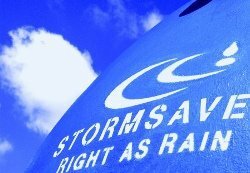 If you’re looking for ways to make your home eco-friendly and more self reliant, then a Stormsaver rainwater harvesting system is perfect for you.